I’m not sure “warning” is the right word, but this is something people should keep in mind. Jesus healed instantly, his disciples (contemporaries of the day who had learned directly from the Master) and the Apostle Paul fell short of Jesus’ level. 2000 years later, MBE and her CSPs often fall short of the amazing feats of physical healing. There should be no shame/stigma in the CS community attached to seeking medical attention. 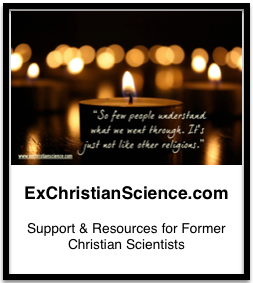 Christian Science practitioners pride themselves in using their Leader’s discovery and system, which is based on the original healing method of Christ Jesus. But please note: All of Jesus’ healings were instant. There was no telling the patient they needed to handle an error before the healing could take place. There was no praying for hours, days, weeks, months and even years with no change in the condition or keeping the prayer up if it got worse. There was no refusal to take a case for moral reasons or for any reason. Jesus never made a second visit; he got it done in the first encounter. Now that is Christian healing as Jesus did it. He may not have used meds, but he did get the job done. There is no reported case where He failed to heal. And He certainly never criticized people for not using His method. The age of innocence is over. If you dig into your past recollections, you can probably conjure up at least a few divine healings that you had experienced or were aware. Overtime, from the forces of modern culture, medical advancement, and how the psychological cloud of failures of healing that overwhelm successes, the dire situation presents itself to us as a “no go” for healing by prayer to continue. It’s a quagmire that Christian Science didn’t anticipate. I can think of several instances where working with a CSP over the course of weeks/months resulted in a “healing” experience, but those situations were predominantly problems that were mental to begin with, or situations where prayer was used in conjuncture with medicine. There is also a difference between listening quietly for the “still small voice” to locate one’s car keys and praying about an injury/illness.